from the blue chair: I do not sew clothes. I hope you all had a fabulous weekend. We're pretty well back to normal. One toy has already been relocated to the basement due to the brawls it has caused between my three children. Seriously, Christmas with three little kids is not all it's cracked up to be. The present opening was over in 20 minutes, and then the fights began. We put the babies back to bed by 9:15 a.m. Despite the fights and tantrums, we did have a good day and were able to enjoy our kiddos and just spend the day with them. Morning naps helped a lot. Now, onto sewing related topics. When I was in Houston at the International Quilt Festival last month, I had a moment of weakness. 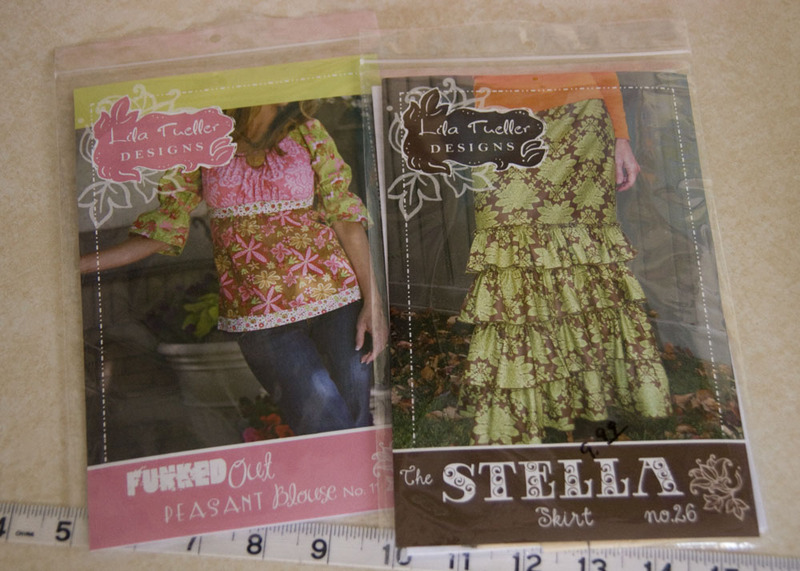 I bought two patterns to sew myself a shirt and a skirt. The woman running the booth was wearing this same top and skirt, and it looked so cute on her. I thought, "I can do that." I should have turned around and left. A few weeks later, I bought fabric. Last week I cut up said fabric--3.5 yards to be exact. The skirt takes A LOT of fabric. It's like wearing your own personal quilt. I really like the fabric. It's from Innocent Crush and my favorite print from the line. Unfortunately, I now seriously regret cutting the fabric. I finally realized I don't want to make the skirt. I don't even think I would want to wear the skirt. It's just too frilly and girly for me. Sure, I have sewn some simple twirly skirts for my girls. I have even sewn a couple shirts for them. Nothing hard. Nothing with darts. Nothing with a lining. Nothing with a zipper. Next time I get the urge to sew clothing for myself, someone should make me write on the blackboard 50 times, "I do not sew clothes. I do not sew clothes. I do not sew clothes. I do not sew clothes. I do not sew clothes. I do not sew clothes. I do not sew clothes. I do not sew clothes. I do not sew clothes. I do not sew clothes. I do not sew clothes. I do not sew clothes. I do not sew clothes. I do not sew clothes. I do not sew clothes. I do not sew clothes. I do not sew clothes. I do not sew clothes." You're so silly, sewing clothing is easy, with a pattern. I taught myself to sew w/o a pattern when I was 8, now, I'm 66, and still sewing. You can do it! Yeah, but do you want to do it? I have things I like to sew and things I don't want to ever even attempt. Since I took my sewing machine out last August it's amazing how many people ask me to sew this and that and mend stuff...and I just don't feel confident or comfortable doing much of it. Some of it I just have to say 'NO' to!! I DO NOT EITHER, I DO NOT EITHER, I DO NOT EITHER. My sister on the other hand does. And is superb at it. I give her all the patterns that I pick up and think that I'll try but don't. I don't sew clothes either. . why sew them when it's more fun to go to the store and try them on. You can't go to the store and get an awesome quilt though. Those are one of a kind. Sewing clothes is too finicky for me. I feel your pain. Good for you for throwing in the towel before you started stitching the fabric! 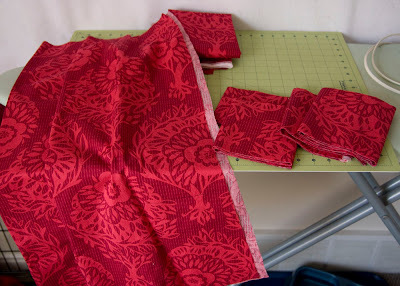 What a waste to have a project using all that fabric stay unmade. Or worse, made and unworn!! Since that red appears to have been cut into a lot of strips, what about some kind of block (maybe even an easy pinwheel or such) that is framed in the red? 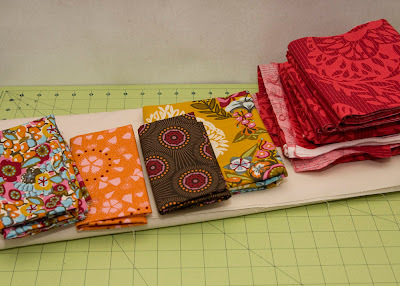 And then use the rest for the backing and binding? I'm with you on the clothes thing. I think I just have a hard time thinking dimensionally. A flat quilt I can deal with. A body I cannot. Also, quilts are fun. Shirts don't sound fun to me, not at all. Nothing wrong with sticking with what you know ... and know you love! You crack me up! I am always drooling at the cute patterns with the gorgeous fabrics. Then I remember, hey - I don't wear skirts! When am I ever going to wear that? The only clothes I ever sew are for my 2 year old. No curves required. Love that fabric combination you put together. It looks great. I second Elizabeth with the Kitchen Windows quilt. that's one of my favorites right now. It's on my list for this year. I am with you. I stick to 2D sewing. 3D gives me a headache. I was going to suggest the kitchen window quilt but it seems to have already been suggested. It would work great!! I love sewing clothes it might help that is what i studied in college though. I am also a huge fan of quilts. I think anyting from those fabrics will be fabulous. I've never sewn clothes and probably never will. Way to complicated for me! I can barely find clothes in a store that fit me right, there is no way i could sew something for myself and have it work! I think you could use that fabric for a number of quilts with a solid. You could do a simple 9 patch but with the pints on the outer part of the square and then a solid center, then sash in a solid. Or...pinwheels. Since you have so much of the red print, do several pinwheels with just that and then the other pinwheels use the red and another print. Or..really any of the numerous half square triangle quilts. Good luck! I'm sure whatever you make will be wonderful. Those fabrics are fantastic! If you really don't want to sew clothes, maybe you could have a friend who does sew them do a swap with you. She/He makes the skirt for you, you make a quilt for her/him. The next time you get the urge to sew some item of clothing go ahead and do it, but start with the cheapest muslin you can buy. Make the item in muslin (or other really-cheap-but-similar-weight-as-your-final-project fabric) first, then cut up your expensive stuff. This is too funny! When my grown daughters were young I made almost everything they wore...made just about all my clothing too. I even made jeans for my youngest daughter...she was allergic to zippers and snaps. I no longer care to do that! That skirt is too frilly for me, so I think you will make something much nicer and enjoy it for years! Thanks for a good chuckle!